SL1100 PSTN PACKAGE 1 Refurb. NEC SL1100 IP Phone System Refurbished with 8 Phone Ports, 4 PSTN Lines and 3 x 24 Button Phones . 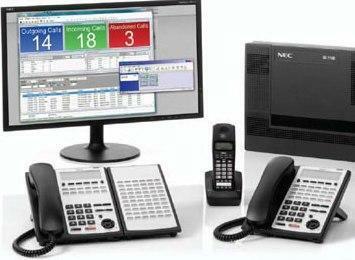 The NEC SL1100 telephone system is NBN Ready and comes with Voice Mail and Auto Attendant built in at no extra cost. The SL1100 offers SIP Trunking for VoIP as well as standard phone line connections like PSTN, ISDN2 and ISDN Primary rate. The NEC SL1100 also allows you to twin your mobile phone and extension number so you will never miss a call again. The System comes with an easy to use GUI interface that allows you to make your own changes to the phone system set up. Key Features include Expandable to 40 extensions, Connect a range of Digital, Analogue and IP handsets. Interface to an on-premise alarm system. Door phone, door striker to open the door to your business. Voicemail with email notification and Automated Attendant Included Free. Dial-in 16 party conference bridge. Mobile extension that allows you to twin your mobile phone and extension number and Built in Hotel/Motel features.